Back view of Fusion robot build. Modern Robotics sells kits for both Spartan and Fusion Robots. Apart from the Controllers, the physical components in both robot kits have many similarities. 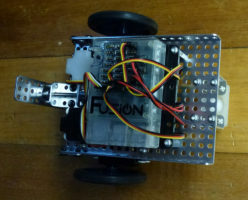 If you own a Spartan Robot, and decide you want to control your robot using Fusion’s Python computer language instead of Spartan’s C computer language, it is possible to successfully mount a Fusion Controller on a Spartan robot base. This note covers what I did to achieve this change. Since the metal components of the Fusion Base Kit are very similar to the metal components in Modern Robotics Inc.’s Spartan base kit, replacing the Spartan Controller on my existing Spartan Robot by a Fusion Controller was fairly straight-forward. My initial Spartan build had followed the Spartan build you can find in Modern Robotic’s Spartan build pdf, and in a YouTube Video, except when it came to mounting the Fusion controller. The Fusion controller is bigger than Spartan’s Arduino controller. Taking my existing Spartan robot, I unplugged the cables coming in to the Spartan Controller, and detached the Spartan Controller from the base kit chassis. I also removed the four standoff pegs used for mounting the Controller, and relocated them in to the positions shown in step 3 and the second step 12 of the Fusion Base Kit Building Instructions. You can also see the location of the back standoff pegs in the image above. The sensors supplied with the Fusion Base Kit are also different from those supplied as part of the Spartan Kit. The Fusion kit contains one Optical Distance Sensor and one Integrating Gyro Sensor. Both are mounted on the top front of the metal base, as you can see in the second step 12 of the Fusion Base Kit Building Instructions. The Spartan Kit includes two Optical Distance sensors. I found it convenient to change the standard Spartan mounting position of the second Optical Distance Sensor to that shown in the left of the image below. This change will help prepare your Robot for the “Robot SUMO Using Fusion” and “Fusion Follows a Line Edge” tutorials, and allows the Gyro Sensor to be mounted in the standard position suggested in the Fusion build instructions.